The Basic Attention Token (BAT) is an open-source, blockchain-based digital advertising platform. It is a pay to surf software product used for the digital advertising industry that links publishers, advertisers, and users of the Brave browser. According to BAT whitepaper, the token was developed to “address the broken digital advertising market.” Developers see the token as a future part of web standards, that will come to solve the problem of monetizing publisher content while protecting user privacy. While the Brave browser and the BAT token have both been developed by Brave Software, they remain distinct projects, both able to function autonomously. The team behind BAT accept that third-party developers may come up with new uses of the token. One example could be its use on other browsers and applications. Furthermore, the developers believe it could be used to pay users for viewing ads within messaging apps like Telegram. They also foresee the creation of different WeChat solutions of integrating the token. BAT can also be applied in the ethereum-based messaging and payment platforms such as Coinbase’s new Token app and Status app. Brian Bondy, a co-founder, and CTO at Brave and BAT, previously worked for Khan Academy, Mozilla, Evernote. Yan Zhu is responsible for security and privacy. Before joining the BAT team she worked for Yahoo, helped build HTTPS Everywhere, Privacy Badger and SecureDrop. The team is being advised by Zooko Wilcox, founder, and CEO of Zcash, as well as Ankur Nandwani, product manager at Coinbase. Brave is a browser that blocks 3rd party ads. 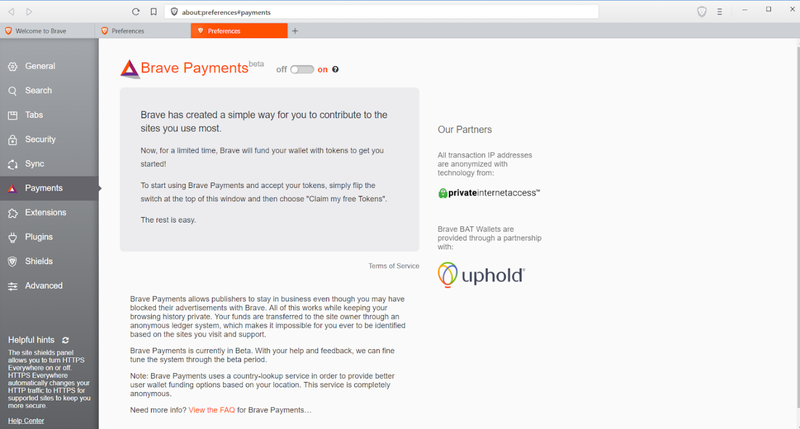 One does not need to pay to use Brave, but those willing to support their favorite websites can do so by paying them with BAT through the Brave Payments. Brave can be allowed to automatically distribute the contributions based on how much time the user spends on the websites. Users can also choose to control exactly which sites receive what percentage of their contributions. Publishers get the funds through an anonymous ledger system, thus allowing contributors to remain anonymous. All browsing history is kept private. Over 18,000 publishers and content creators have registered to receive Brave Payments. These include over 4,500 websites and 13,500 YouTube and Twitch streams. Publishers wishing to verify with Brave should sign up at Uphold. Publishers will need a verified Uphold account in order to receive contributions. Verified publishers can then collect BAT payments and automatically convert them into fiat currency. Price tracker CoinMarketCap.com currently ranks BAT 47th in terms of market capitalization. 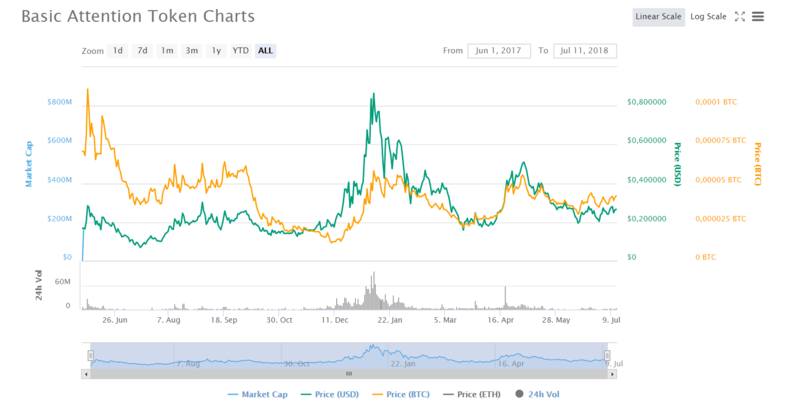 With a total market cap of over $265 million and a daily trading volume of roughly $4.2 million, one BAT token currently costs $0,265467 (or 0,00060471 ETH). During its initial coin offering on May 31, 2017, the Basic Attention Token raised $35 million in less than 30 seconds. The ICO saw the total supply of tokens (1,500,000,000 BAT) generated. Only ethereum was accepted on the sales day with the cost equaling to 1 ETH to 6,400 BAT. The sales totaled 1 billion tokens with a total worth of 156,250 ETH. A further 200-million development team pool was created. Another 300 million BAT were allocated for a user growth pool (UGP). These tokens will be used to encourage users to join the BAT platform. BAT is meant as a transferable utility token to be used for conducting transactions and obtaining serviced on BAT platform. Although it is listed on a number of leading cryptocurrency exchanges, including Binance, Bittrex, Huobi, and others, exchange trading is in no way encouraged by developers. To purchase BAT, it’s first necessary to buy bitcoin or ethereum. The full list of exchanges in which one can purchase BAT, is available here. As a token built on top of the ethereum blockchain, BAT can be stored in any ERC20 compatible wallet. MyEtherWallet could be a good option to store the tokens and transfer them to a paper wallet. Those who prefer a more secure storage for their holdings in BAT can choose between hardware wallets such as Ledger Nano S or Trezor. Next, it’s necessary to click on the on/off button to turn on the wallet and payment system. One can then claim free tokens or fund the wallet with the preferred cryptocurrency - bitcoin, ethereum, litecoin or BAT - by transferring tokens to the corresponding wallet address. However, all funds sent to the Brave wallet will automatically be converted to BAT. Those who wish to convert fiat money into BAT can do so by signing up to Uphold or other exchanges. While Uphold provides free services to verified users, other exchanges will charge fees. In the future Brave developers are planning to add the ability to directly fund the wallet with a credit card. Once added, BAT tokens cannot be transferred out of Brave, as its wallet is unidirectional. The only use envisaged for the tokens is to contribute to publishers of preferred websites, to help fund the content you love. Tokens used in the Browser may only be donated or used to pay publishers for premium content or for other services. Meanwhile, publishers can use the tokens to promote their content. Brave now has 3 million active monthly users - Brave recently exceeded the threshold of 3 million monthly active users and expects to pass the million mark before the end of the year. Brave has also been listed in the Top 10 category of “free communication apps” for its Android browser in the Google Play Store in the United States as well as in 20 countries across Europe, Asia, and the Americas. 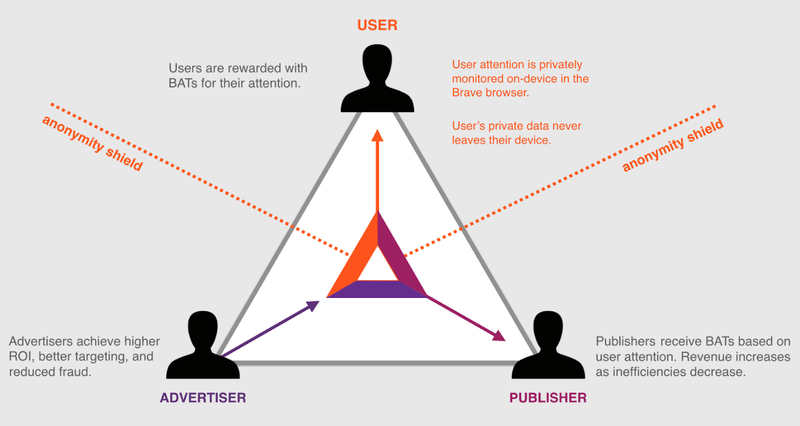 Brave gives away $500,000 BAT for browsing- In early June Brave announced plans to give away about $500,000 in BAT to desktop browser users. The grants come from the 300-million BAT User Growth Pool (UGP). The funds can be used to support favorite websites, YouTube channels, and Twitch streamers and must be used within 90 days. Earlier this year Brave allocated $1 million to content creators to encourage them to inspire publishers to sign up for the technology and urge their followers to follow the lead. Brave pledged about $5 to everyone who installed and used Brave for at least 30 days. Brave partners with Dow Jones Media Group - In April 2018 Brave partnered with Dow Jones Media Group in a deal aimed at bringing premium content to new audiences and testing blockchain technology usage in digital publishing. According to the deal, Brave makes the premium content from Dow Jones Media Group available to a limited number of users who download the Brave browser on a first-come, first-serve basis.